Only one match went ahead in Division One of the Halifax AFL on Saturday and a single game in Division Two but all three scheduled fixtures were played in Division Three. Copley United were 2-0 winners over Ryburn United Reserves at Shroggs Park in the first division. Free-scoring pair Gary Ash and Lee Worrall netted to lift their side to second place. St Columba’s warmed up for next weekend’s Halifax FA Cup quarter final against Shelf United with a comfortable 6-1 victory against Hebden Royd Red Star Reserves at Natty Lane. 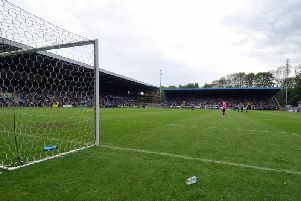 That enabled the second-placed side in Division Two to reduce Plummet Line’s lead to five points. Ryan O’Neill opened the scoring after closing down the keeper and walking the ball into an empty net. Andy Sandells ran clear from the halfway line to score the second with a composed finish. The third goal was a nonchalant long range effort from Kutubo Touray who found the bottom corner with the outside of his right boot from range. Saints continued to dominate in the second half. Vinny O’Shea chipped the keeper from range and Maccauley Mountain added to the tally. Chris Garbutt pulled one back for Hebden but the last word went to Saints as O’Neill dinked one over the keeper. Division Three champions elect Mixenden United won 6-2 against FC Ovenden at Four Fields. They were 3-0 up at half time and cruised to success with the help of a Callum Blezzard hat-trick, two goals from Chris Woodhouse and one from Martin Woodhouse. Connor Atkinson and Danny Hildred replied. There were away wins for Shelf FC Reserves, by 2-0 against Brighouse Sports Reserves, and second-placed Stainland United, by 2-1 against Flying Dutchman.